It’s been a whirlwind couple of weeks for me, with lots of travel. The big journey was a dissertation related conference in France, where I had the good fortune to spend three days in the company of a large number of folks interested in the relationship between colonialism and indigenous sovereignty and to spend a week immersed in the museums of Paris. Readers of this blog, however, will likely be more interested in an earlier sojourn, to Drew University in New Jersey to present on the SIF at a major conference on the future of graduate training for historians. The response my paper received suggests to me that we are on the right track with our ideas about how the SIF could fuel a reimagining of graduate school. In fact, I was struck by how audacious the fullest version of our plans, notably the proposal we recently submitted to the NEH, really are. This was both encouraging and, in a way, discouraging, as it brought to the surface the heavy lifting we will have to do to achieve our goals, and the many potential obstacles in our way. But there is also great promise. Unsurprisingly, 3D Atlanta, the showpiece of the SIF, garnered lots of interest – and it is the historical aspect of that project, in particular its implications for the politics of historical representation, that I want to write about today. After my panel, I had a long discussion with James Grossman, executive director of the AHA, and Kolleen Guy, a professor of history at UT San Antonio, about VR as a historical tool. We began by talking about the limitations of VR – the way it promises a “virtual” experience, but may not be able to recreate the smells, sounds, and tactile experience of the past. Some of these, notably the soundscape of the city, seem technicallly possible, while others – the smells for instance – are not yet to my knowledge feasible. Either way, they point to the need for great attention to detail, which I think is clearly on the minds of those building the city. Certainly, previous blogging about getting the night sky correct, for instance, suggests this. On a theoretical level, however, it suggests the need to think carefully about how to seek authenticity and close recreation while avoiding presenting what will necessarily remain a recreation. This issue becomes particularly acute once the game like aspects of the project begin to come on line, and the static cityscape becomes a platform for historical narrative. We talked extensively about the politics of the representation within VR. 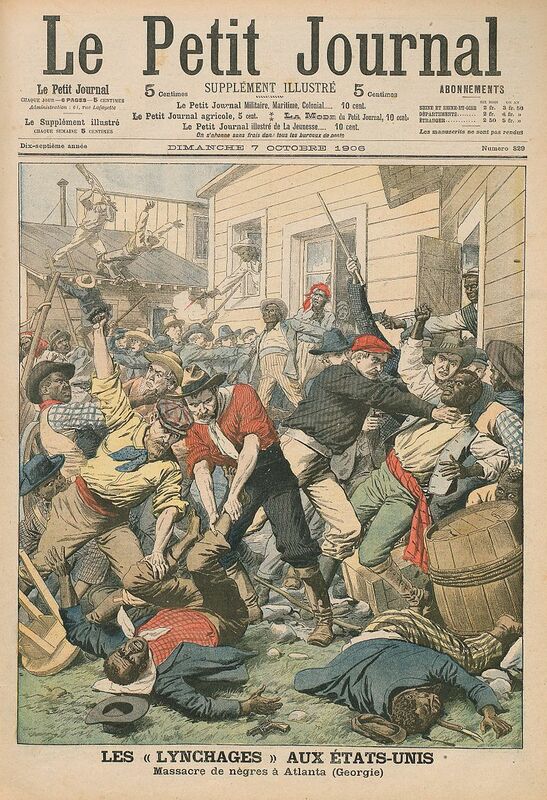 For example, I broached the slightly anachronistic, but interesting possibility, that 3D Atlanta could serve as a slightly anachronistic setting for a “game” based on the 1906 race riots. What, we wondered, would it be wise or unwise to portray. To achieve a maximum of historical accuracy, one would need to be frank about the extent of racialized violence, including the murder of several African Americans. Because of the intensity of VR representations, narrating these events would pose massive and thorny problems. Do you include racial slurs in the soundtrack, do you depict lynchings? If so, how do you do so tactfully and how do you try to control the representation? If not, are you avoiding the hard truths of one of the city’s most historically significant events? Historical re-enactment of the old fashioned kind has found itself on occasion beset by exactly this question. Colonial Williamsburg, for instance, held a recreation of a slave auction several years ago, to much criticism. Representing slavery at Williamsburg remains a live issue in ways that textual representations are not. Few historians blanch from detailing the horrors of slavery in print, but when staged visually, they acquire new types of power that pose huge issues about what and how to represent. Yet, as a place like Williamsburg clearly reveals, slavery and race are also issues which must be represented. Certainly, any historical representation of Jim Crow Atlanta must have the courage and tact to take on the city’s pervasive racism directly. But this will be a high risk representation and speaks to the vital need for careful thought and historical input when the project transforms from a static to a dynamic environment. vr photo by fotologic (https://www.flickr.com/photos/fotologic/3862190141), creative commons attribution 2.0.